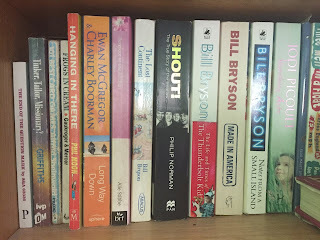 When the austerity measures imposed on local government started to kick in, in the UK, (yes, I've been brewing this post for a while) people were campaigning against the closure of libraries. Libraries are probably viewed as an optional extra, whereas things like rubbish collection aren't. I was glad the people were campaigning because it made me less guilty about the fact that I love libraries. When I was a child the library assistant at my local library, who knew me because I was friends with her son, gave me the adult allowance of six library cards, instead of the children's allowance of three. I was so happy about that. (That’s blogrolls not bogrolls. Stop sniggering at the back there.) Back in the days when only scientists and software engineers knew about algorithms, and the words “filter” and “bubble” were only next to each other on a Scrabble board, we had blogrolls. This would be a selective list of the blogs that you subscribed to placed on your own blog. Selective because only the bravest people put all their feed subscriptions on public show, unless you didn’t mind everyone knowning you had a thing for Selzer drinks or dogs dressed as Star Wars characters.